Keeping tall or extra-wide hedges in trim, a long-reach hedge trimmer can save the time and expense of erecting a scaffold or working platform and means you can maintain your hedge with your feet safely on the ground. Most long-reach hedge trimmers have a swivelling cutting head, so you can set its angle to trim along the top of a hedge or to reach across a flower border for example. 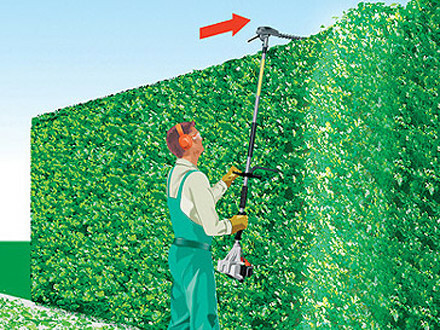 The angled cutter bar enables even the top of tall hedges to be cut above head height. 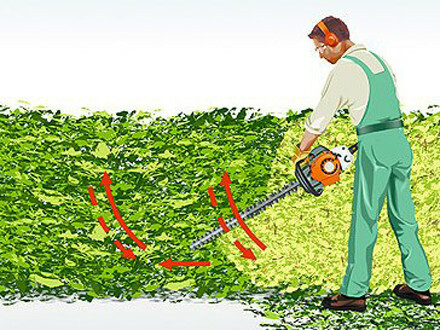 When cutting the sides of a tall hedge, simply adjust the angle of the cutter head according to your working position. Keep it straight when you are close up, set it at an angle when you’re standing apart.